And last night, I went to the Queen of Naples ball, and followed that up by seeing the most cheesetastic movie ever, The Three Musketeers. Naturally, we went in our costumes. The movie was hilarious, but visually lovely, with some truly terrific swordfights, and if you're in the mood for some ham and cheese whiz, I highly recommend it. I also managed to snap some of my favorite squirrel pictures ever yesterday. A nearly finished photo shoot! The floral polonaise is almost done! All it needs is a hem on the bottom of the gown and on the sleeves, and a hook and eye at the top of the bodice and on the belt. I've also decided to add a little scalloped box pleated trim at the cuff of the sleeve, and I need to make a real fichu. At this point, I'm planning on wearing it to the opening ice cream social at Costume College. But since it looks pretty much done, I decided to have a photo shoot today! So here are some of my favorite pictures of the floral polonaise, the 17th c gown, and the chemise a la reine, under the cut. I'm thinking about creating some business postcards, since I would like to really get into creating costumes to sell to other people, but I don't really know what I should put on them. Thus, if anyone an help me, I'm going to post pictures of what I think are my best projects, and if you can all vote on what should go on there, that would be really helpful. Unfortunately, I don't have about half the costumes with me right now, so I'm not able to retake pictures of any but the 17th c gown, the medieval, the navy ren gown, and the chemise a la reine (and it would involve finding someone to take the pictures, since I know the bathroom mirror ones aren't particularly professional). I put the lace on yesterday, and did the hem this morning, which means the chemise a la reine project is complete. I finished binding the stomacher of the stays, and the tabs on one half of the stays. Here's some pics of Antoinette in all the pieces, including the stomacher of the stays. I finally went and tried everything on this morning, and found out my petticoat is actually long enough that I don't even need to make a ruffle! So in other words, since the hem of the petticoat is the selvage, the petticoat is done. Eventually, I will go back and press the pleats, but I'm going to wait until after I move, and have access to a full size ironing board. Tomorrow, I should hopefully get a chance to run to Joanns for the lace for the sleeves of the chemise a la reine. I started pinning the hem today, and once I have the hem and the lace done, the chemise a la reine will be done, since I decided it probably doesn't need the drawstring waist. And yesterday, I started a short-sleeve chemise to wear under my stays. I still need to add the sleeves and gussets, and do the hemming, but the neckline and side gussets are done. And, as per my plan, the binding of the stays is coming along slowly but steadily. After three hours of handsewing the lace to the neckline today, it's getting close to being done! I still need to add lace to the sleeve edges, and I need to hem the skirt, but other than that (unless I decide to add a drawstring at the waist) it's done! I also started the petticoat for it today. It's light blue sateen, knife pleated, with a ruffle. I didn't buy enough of the sateen for the ruffle, so I'm heading back to Joanns on Sunday to finish that, and I still need to press the pleats, and then it will be finished. The stays binding is coming along, and tomorrow I will probably wind up starting a chemise to wear underneath everything. Here are the pics! I figured out the sleeves today! And I changed the lace to a longer lace, which I am ruffling with blue velvet ribbon. Tomorrow, I hope to do the sash, and maybe start the petticoat. I also now have a big bag of scraps, which I'm tossing, if I can't find a quilting group that wants them. I've never been a particularly good hand at fitted sleeves, so I need some help. I can't figure out why the chemise a la reine sleeves are fitting so oddly into the shoulders. Here are some pictures. For one, the chemise feels like it's pulling in the shoulder - you can see it pull where the sleeve meets the top of the back. And for two, both sleeves are bubbling up, and sticking up above my shoulder at the seam. Also, does the lace seem too short to anyone else, or am I crazy? I went to go put on the sleeves today, but I realized that the shoulder straps I made by following the Norah Waugh pattern were really way too narrow. So I took them off, and made straps about twice as wide, and 1.5" longer, so there would be a little more room in the armseye. Of course, this means I now need to re-cut out the sleeves, because they are now smaller than the armseye. Speaking of which, there's no need to do a gusset in these (fitted) sleeves, right? In any case, I won't have any more time to sew until after work tomorrow night, since I work from 8:30pm-2:30am tonight, and 1:15-9:15pm tomorrow..
And then on Monday,I'll finally be able to go to Joanns! I wasn't letting myself go for the last few days, because I want to be able to use coupons. I had to run a bunch of errands today (like bringing back my supposedly fixed computer to Geek Squad), so I didn't get too much sewing done today. I did, however, bind one tab on the stays (I've decided to force myself to bind at least one tab/day), and I gathered the chemise a la reine into it's neckline. So here's some pics, with the chemise a la reine being worn over my green blouse pretending to be a chemise, my bum roll pretending to be a bum pad, no stays, a pink elastic-waist petticoat pretending to be a knife-pleated 18th c petticoat, and a red polka-dot scarf pretending to be a taffeta sash. At this point, I'm kind of wondering if there's too many gathers in the front. The front only has 8" more fabric than the back, but it felt really poofy. And I'm also fairly certain I will wind up adding a waist drawstring, since it kept wanting to shift out from the sash. But that will wait until after the sleeves are added, anyway. Also, on my errands, I decided I would finally visit the largest McDonalds in the country (which happens to be 10 mins from my house) and here's a pic from that, too. Can you believe you can get this at McDonalds? They had pasta choices and a whole bunch of delicious looking desserts, too. Despite not leaving the house (for the 2nd day in a row) today, I got very little done. I decided to go ahead with the stays binding, and in about 1.5 hrs worth of work, this is what I accomplished. I managed to do one edge of the binding (I just turned it over in the picture) on three tabs. Is it really supposed to be this slow and laborious, or am I doing something wrong? All it is is the big tube of fabric (three panels of 56" wide by about 60" long), and I followed the contours of the pattern in my cutting, though I had to drop the bottom of the armseye down around 2-3". It's just pinned to the form right now, but tomorrow, I'll gather it all, sew the back to the strip of fabric, and hopefully figure out how I plan to do the drawstring in the front. I decided to do the gathers all around (this picture shows the back), with the fitted elbow-length sleeves, and a lace ruffle at the neckline and the bottom of the sleeve. Why can't the stays come together as quickly as the chemise a la reine?! I did all the eyelets in the bodice today. I've never made an unboned bodice before (or, for that matter, a bodice that only laces up the back - that was a little tricky! ), and I don't know how to get rid of the wrinkles in the back. Is this normal/does it look okay that way, or should I attempt to add some boning to get rid of that? Also, I'm leaning towards doing the Chemise a la Reine next. I like the fitted back, like the one demode did (PS - anyone know what happened to her site? ), but I also like the gathered back, like in this painting. I know I want the fitted sleeve and the ruffled lace at the neck. Any suggestions? I have decided to create a dress diary blog - both so I can remember what all I do with each of my projects, and to share and connect with other costumers. Hopefully, I will remember to actually post as I go. And hopefully, I will figure out how to use a livejournal in the first place. Wish me luck! To begin with, I'd like to share my current state of Project ADD. I've never had it this bad before. I started my pre-Raphaelite outfit for Costume College last night - I cut out all the chemise pieces except the sleeves, and I put it together, and did the gathering I needed for the empire waist, and a sleeve mockup. But now I have to wait on trim and buttons from Pillaged Village to get here so I can do more. 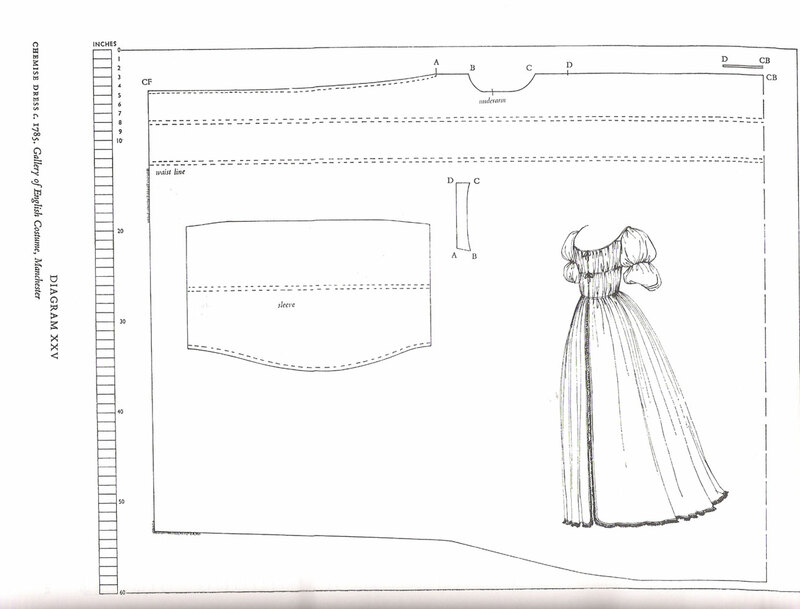 And the whole while I've been thinking about that, I've been looking up info on the Chemise a la Reine, and I ordered 8 yds of cotton lawn on fabrics.com so I can start on it, and I'm trying to figure out how to make it from a pdf pattern posted online of Norah Waugh's book. But I still haven't done all the hand-binding on my stays yet, either, which is lurking in the back of my mind. And I keep thinking about a Polonaise, even though that won't be happening until all the other projects are done. I feel like I'm going crazy! I just want everything I've ordered from online (dress form, fitting system, cotton lawn, 18th century shoes, buttons, and trim) to get here so I can work on everything.